PUXICO, Mo. -- If you thought you heard a group of owls, wild turkeys, squirrels and other wildlife celebrating at Duck Creek Conservation Area (CA) Saturday morning, you were mistaken. 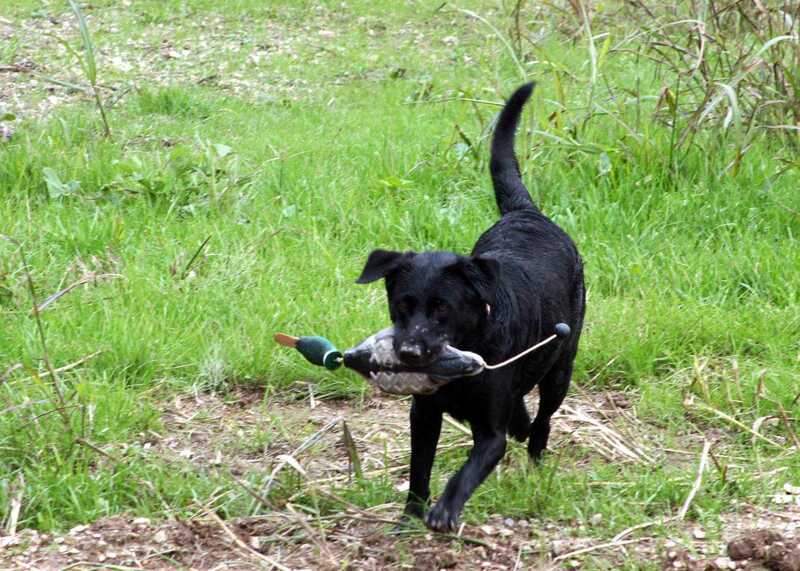 Although the area is populated with a wide diversity of wildlife, the Saturday morning calls were part of a wildlife calling program that kicked off a joint celebration of the 75-year anniversaries of both the Missouri Department of Conservation (MDC) and Ducks Unlimited (DU). 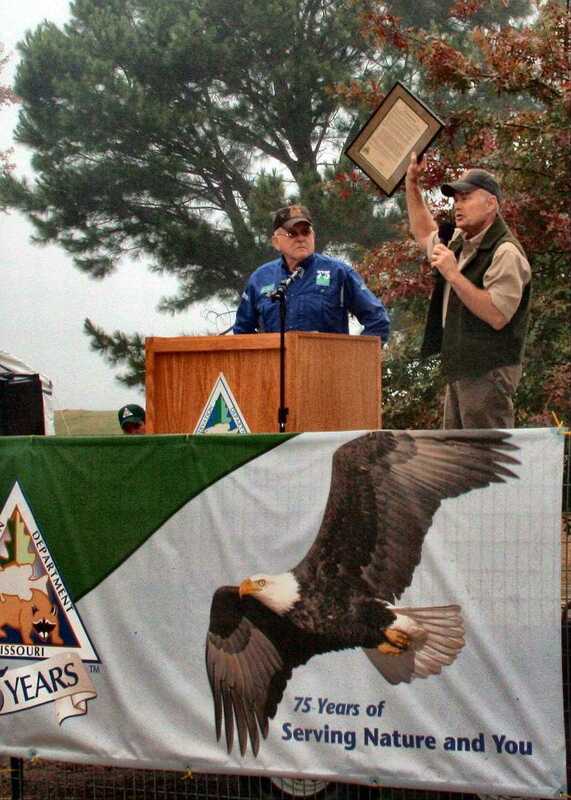 "Duck Creek is the perfect location for this event because it's an example of long term commitment to our citizens and to developing wildlife habitat," said MDC Deputy Director, Tom Draper. Draper said the MDC has used technology at Duck Creek to restore the natural, historical landscape, improving the wildlife habitat while increasing the ability to lessen flood problems for neighboring landowners. "We want to be good neighbors," Draper said. "Also, it's significant that we get to celebrate this event at Duck Creek with Ducks Unlimited, which has been a very strong partner in the work at Duck Creek." Draper was joined by Dave Hakes, DU's Missouri State Chairman, who shared remarks at the opening ceremony. "This is a great day and this has been a great partnership," Hakes said. "What MDC and DU have done together over the last 75 years has contributed significantly to the natural wetland resources and to the citizens of Missouri. How interesting and significant it is that we share this anniversary." Over 175 guests joined the group for festivities. After the short morning ceremony, Jake Hindman, an Outdoor Education Center Supervisor with the MDC, gave the wildlife calling program which set the stage for a series of activities hosted by MDC, DU, U. S. Fish and Wildlife Services staff and volunteers. Presentations included wetland management techniques, history of the Mingo Basin, demonstrations of working retriever dogs, cork-duck decoy construction, rocket netting, electrofishing and kids' activities such as a wetland critter safari. Guests also took hayrides through the timber and wetlands on the area. Mary Miller of Jackson brought her two granddaughters to the event because she said the event offered new and exciting experiences. "All this variety of activities is great for the girls," Miller said. 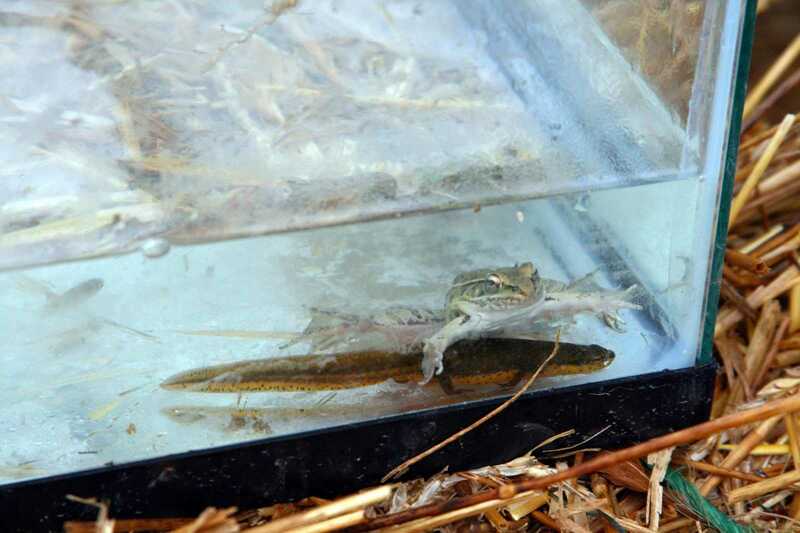 "We love the opportunity to explore the conservation area, the wetland, and we'll definitely come back here." According to Wildlife Management Biologist, Matt Bowyer, Miller and her granddaughters were just the kind of guests the MDC was hoping to attract to the event, because the activities were intended to help people, especially families, discover nature. "We hope our guests have made memories as they explored the outdoors with us," Bowyer said. "Those memories are the foundation that grows future conservationists, and that's what will project success for both MDC and DU for another 75 years." Bower said many thanks go out to the partners who made the event a success, like the Puxico Future Farmers of America (FFA) chapter, who provided food and drinks for the day. For more information about Duck Creek CA, go online to the Duck Creek blog at http://tinyurl.com/9oqe444. 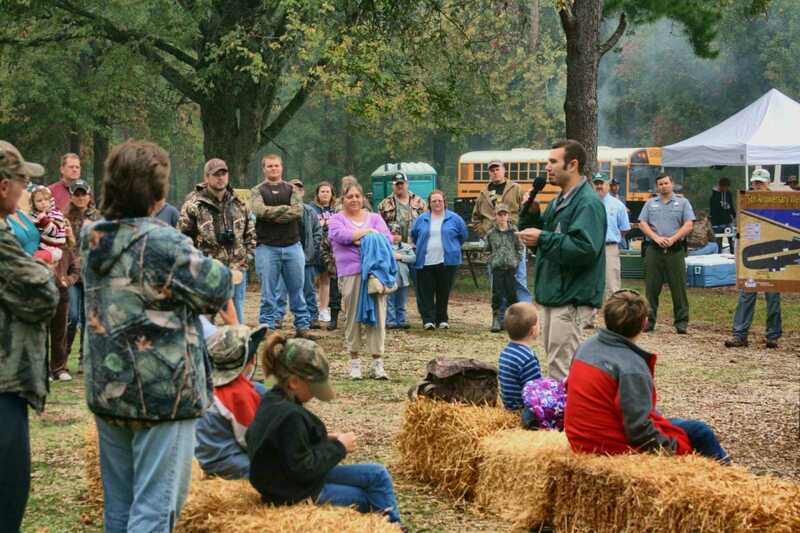 Jake Hindman, an Outdoor Skills Center Supervisor with the MDC, gave a wildlife calling program to start events at Saturday's Wetland Field Day at Duck Creek Conservation Area. MDC Deputy Director, Tom Draper, presents a plaque to DU Missouri Chairman Dave Hakes. The Wetland Field Day held at Duck Creek Conservation Area on Saturday was a celebration of 75-year anniversaries of MDC and DU. Sherm Smith of Dexter headed up one of the most popular activities at the Wetland Field Day were the Retriever Dog Demonstrations. 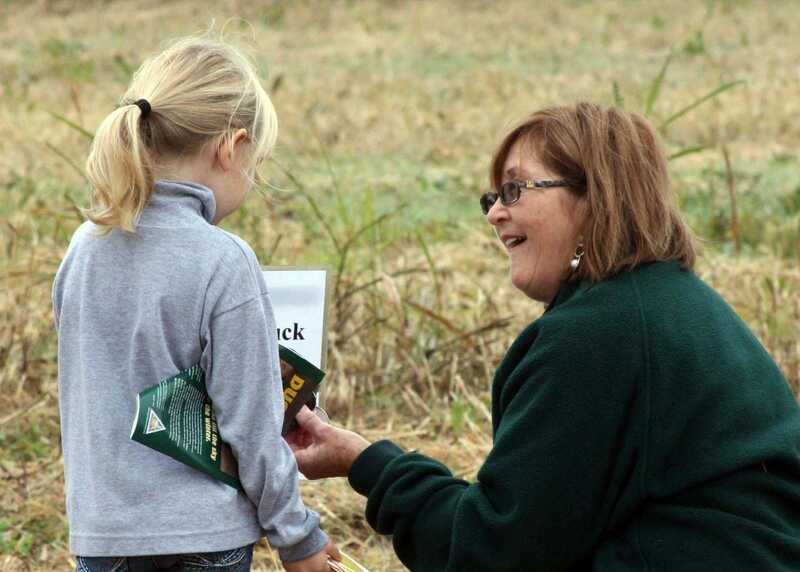 Mia Foote, 8, of Gordonville, attended the Wetland Field Day with her grandmother, Mary Miller, of Jackson. 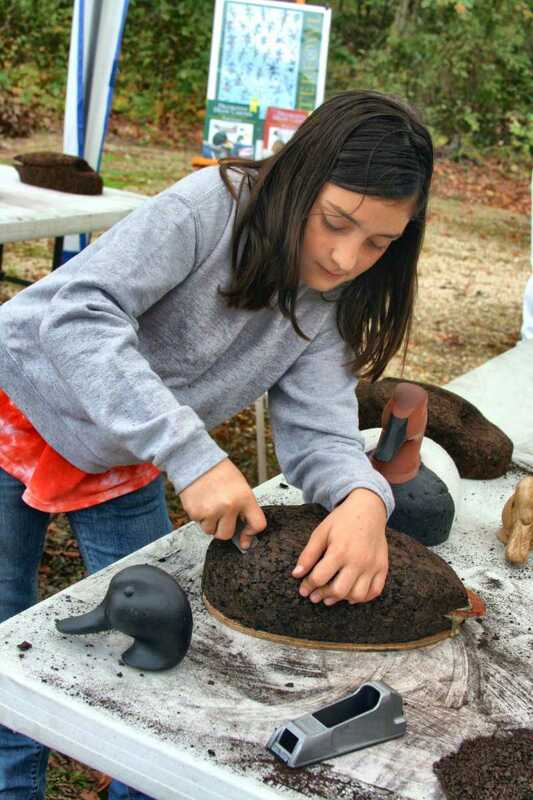 Here Mia is carving a cork duck decoy. MDC Education Specialist Pat Holloway helps a girl learn how to identify varying duck species at Duck Creek Conservation Area on Saturday.